We love celebrating strong, successful women here at The Caviar Spoon, which is why we’ve created ReBelles. These are the women who are working it and owning it in life, work, and everything in between. Our newest ReBelles are the talented mother-daughter design duo Pauline and Tamburai Chirume who are the creative forces behind the South African luxury accessories brand ONEOFEACH. A couple of years ago, I happened to be window shopping in Johannesburg when I found myself drawn into a little boutique called ONEOFEACH because of the rows of brightly coloured handbags. 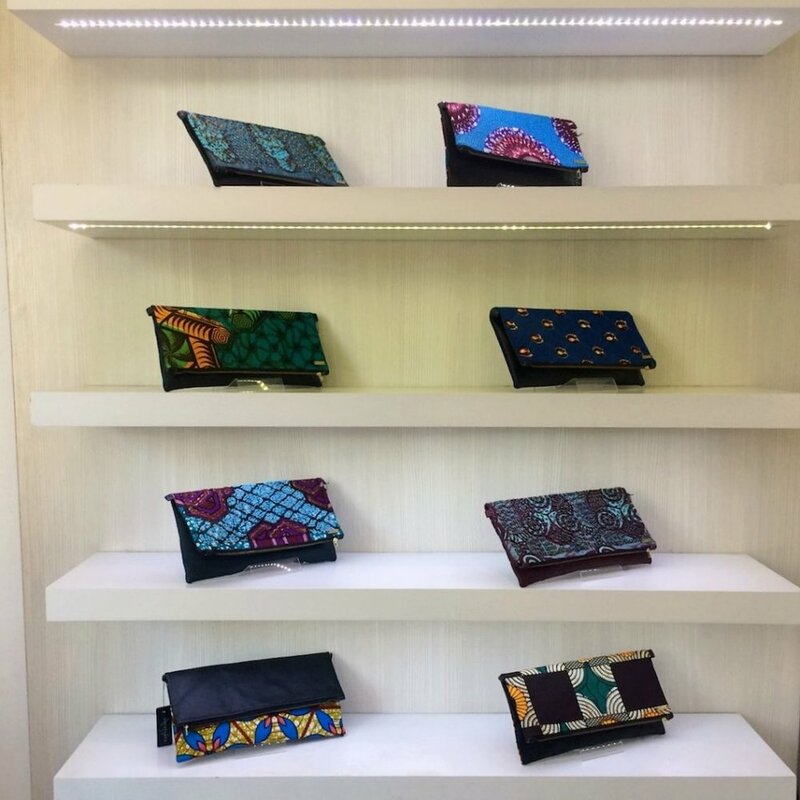 Not just any kind of handbag but a foldover clutch that had soft leather on one side and gorgeously vibrant African print fabric on the other. Every single bag was different. I found out that even if the same fabric is used for multiple bags, the placement of the pattern isn’t the same in any of them, making the bag that you buy solely YOURS. For someone who can take 15 minutes just trying to decide if she wants an omelette or eggs benedict for brunch, trying to pick out ONE bag from a whole stock of distinctive colours and prints is a special kind of (delightful) hell. I walked out of the store that day empty-handed because I just couldn’t decide which one I wanted! Did I want the cream leather with the bright pink and purple pattern? Or maybe I should get navy blue with a more muted palette of browns and greens. Or classic black leather with a strong geometric pattern in warm summery hues. I’m also a firm believer in the shopping philosophy of sleeping on it. If I’m really loving something, I usually force myself to leave it behind and if I’m still thinking about it days or weeks later, then I take it as a sign that I should go back and get it. Of course, this sometimes backfires when what I was lusting after is no longer available but then I just think that it wasn’t meant to be. Anyway, fast forward to this year when we at The Caviar Spoon decided to start covering South Africa, as well as go full force with hunting down ReBelles from around the world. ONEOFEACH was one of the first brands to pop into my mind. Not only are the bags themselves fantastic, but the masterminds behind the label, Pauline and Tamburai Chirume, are actually a mother-daughter design duo based in Cape Town. I was completely inspired by how these two have created a beautiful luxury line that is modern whilst still honouring the traditional artistry of African textiles and paying respect to the culture and heritage. Plus, I’ve always been a fan of supporting local artists and businesses, especially those run by strong, creative women. The fabrics are made through traditional methods such as wax printing and pit-and-stone dyeing and every bag is labelled with the country of origin, from Malawi to Nigeria to Zimbabwe. Mine (yes, I finally bought one!) is from Cameroon. They are all so uniquely different and every bag feels like it’s been made with tons of love and has a story behind it. Despite Tamburai’s super busy schedule (she’s currently touring around the US right now as part of the International Visitor Leadership Program), she graciously took time out to answer our Caviar Q&A on behalf of her and her mother. Keep reading to learn more about these fierce ReBelles and the equally fierce and fashionable ONEOFEACH brand! Pauline hails from a fashion design background with over 30 years of experience in design and manufacturing. She previously owned a factory in Zimbabwe before relocating to South Africa in 1992 to join her husband who had come to Cape Town to start a travel agency. With both of her parents being entrepreneurs, Tamburai naturally followed suit. She’s had a broad career that started in retail working for most of South Africa’s top retailers and then led to 6 years in the world of wealth and investments in the banking sector. During that time, though, she never stopped nurturing her creativity by doing freelance styling and working with top international magazines like Elle Bulgaria. Her asset management experience has proven quite beneficial as it equipped her with the business savvy to turn the creative vision of ONEOFEACH into a profitable business. Ed. note: some answers have been edited for clarity. When Pauline designed the fold over bag, it was decided we would only ever make one of each and make sure the world is able to access this product. We work so amazingly well together and take inspiration from each other more than anywhere else. Our business and designs are a true reflection of our relationship as mother and daughter. What’s been the biggest reward to date being a designer? Our biggest reward has been receiving an amazing welcome and following from all over the world and not just in our immediate environment. We love to unplug and reset our minds. Sometimes there is just so much going on in the world that as people, we need to reboot, unplug, and focus on the inner being which helps us see things clearer without bias. We believe that is where our inspiration comes from. We can only measure success when we have been able to make a significant change in society. We believe that our role in manufacturing is to create jobs, up skill people, and create opportunities. Once we have managed to measure that on an equal footing of making a good profit, then we can then say that we are a successful entity. What do you struggle with now as business women? We cannot really say that our industry is male dominated and we also cannot say that we do not have struggles as women in business. Right now in South Africa, there are plenty of opportunities as women in business. While we face challenges that might come with adversity, we mainly focus on the positive and the truth is, there is a lot of support as women in business, especially in manufacturing. The biggest learning lesson since opening up your business? Grow at your own pace. Also, unique customer service and client recognition in business are the keys to success. Grow your network. Your network is truly your net worth and doors to many opportunities come through building and nurturing relationships. When it comes to your industry, people must think of you first as a point of referral. With equal access to opportunities, that is how we break barriers. Relationship building takes time, energy, effort, tolerance of the human being, and patience. Breathe, there is always a solution. What’s your one piece of advice on how to achieve a work/life balance? Rest is extremely important. Running a business is not easy but you need to learn to take time off and recharge. Available to purchase in more cities across the world. What’s your signature piece and why? Our beaded range, which we launched this year. 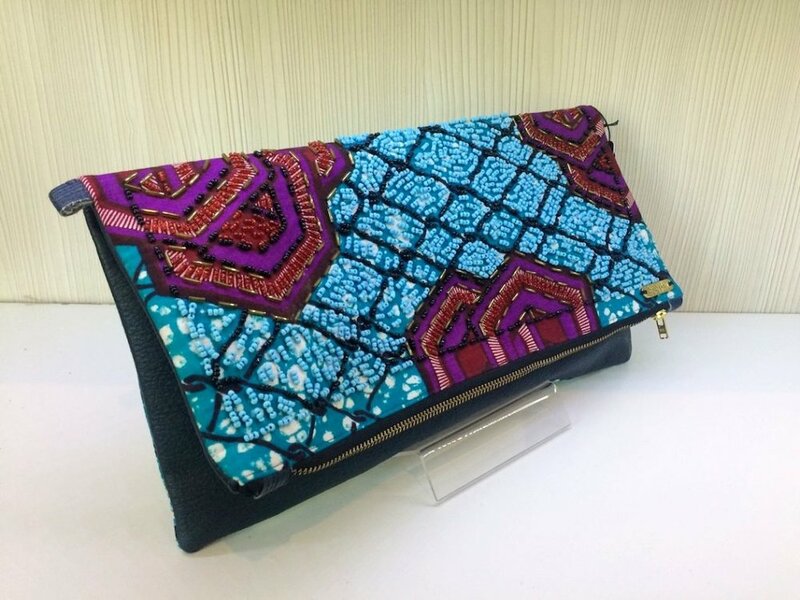 It is intricate beadwork that follows the patterns on the Ankara fabrics we use; it brings a new dimension to the fabric itself and makes the bag an art piece. One lady in business who deserves a shout-out is…. And why? Bev Missing, founder and owner of Rain Africa. She’s a beautiful businesswoman with an amazing energy and a loving spirit. Respect is a very strong word to attach to one individual. We believe that every human on earth deserves respect as respect begets respect. The gift of giving is a great blessing, keep giving. Being a change agent in Africa through breaking barriers and contributing to the greatness of what Africa has, which is so much unknown luxury. Anything we should keep a look out for? Fashion shows/new designs/developments? On July 29 we will be hosted by the George Washington University Textile Museum shop for a trunk show in Washington DC, USA. If you’re in Johannesburg, ONEOFEACH is stocked at Hse of Bespoke at 44 Stanley and The Department Store at The Cosmopolitan in Maboneng. In Cape Town, you can find their stores at the V&A Waterfront and Bay Harbour Market in Hout Bay.